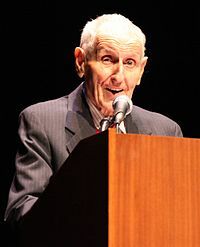 Jack Kevorkian, the outspoken, determined, abrasive champion of physician-assisted suicide died last Friday in a Detroit area hospital. He was 83 years old and died of natural causes. He took on one of the most thankless jobs around…trying to get people to actually talk-and-do something constructive about how we die. I’d like to sincerely honor him for his efforts in that direction, however controversial his methods, as well as wish him a smoother journey going forward than he had while he was here. May you rest in peace, Dr. Kavorkian. Thanks for having the courage to try and do something. You were braver than most. Personally? I admire the man for his bulldog tenacity in trying to make us look at how we treat those who are dying. Back in the 90’s the terminally ill were holding the very shortest of straws, and really, somebody had to stand up and fight for them. Kudos to Jack for being willing to put the target on his back. The problem is that of unmet suffering – indeed, unaddressed suffering – among many of the terminally ill in this country. Kevorkian deserves credit for loudly calling attention to this situation in a manner that the public – and the medical profession – finally can no longer avoid. …This regrettable frequency of uncontrolled symptoms exists because of a critical deficiency of medical education as well as a lack of commitment on the part of established medicine to do whatever is necessary to alleviate the distress of the dying. The requisite knowledge, medicines, techniques and technology exist; they are simply not being applied. Physicians who do not aggressively respond to anguish among their dying patients deserve the sternest professional sanctions. I think that the main thing Dr. Kavorkian was fighting for, access to a humane death, has been accomplished with the advances we’ve seen in hospice and palliative care in the last couple of decades. In hospice care there are already established protocols in place that allow the possibility of medicating a dying person enough to successfully control their pain and suffering, even if it involves death as a possible outcome. (That’s a whole other blog post that I’ll tackle soon.) For now, the biggest problem I see is that the majority of people still aren’t using hospice and palliative care services anywhere near enough. 3) educate the general population on what hospice and palliative care really do so they’ll more readily turn to them when the appropriate time comes. The conversation about dying in this country has come light years since Jack Kavorkian first forced us to start talking, but overall the topic remains an elephant looming large and untended in the room. Personally, the idea of legalizing assisted-suicide makes me a little nervous. It’s not a moral issue for me, it’s a social one. As David Callahan mentions in The Troubled Dream of Life, we already have three other ways we get to legally kill one another (war, capital punishment, and self-defense) and for all our sakes, I’d rather be shrinking than growing this list. Social fabrics are fragile under the best of circumstances. I can’t help but feel it would be wise to proceed with caution and have a much more open, reasonable, and in-depth public conversation before we decide. I hope you might mention the story about one of your patients who chose to stop drinking water…as a way to put an end to his (and his families) suffering. he got a real bad press over here… and I found it interesting he was actually sent to jail! with my brother so ill this strangely is a subject oftne in my mind…. Thanks…over here he was either a hero or demonized. There was almost no middle ground…which is a problem of course, because middle ground is what we need to have a meaningful discussion that leads to constructive change. I’m not sure which most people are more afraid of; dying or having to talk about it. I, too, thought of Mr. K as an underappreciated visionary. I also struggle with the notion of euthanasia. Good lord, we can’t even agree on the need and validity of birth control in this country! And the legal/moral questions that float above euthanasia are mind boggeling to me. BUT, I hate the idea that options may be denied to me or to someone I love. I like the three steps you propose. For the time being, they seem the most rational approach to a loaded topic.